Let’s be honest, Bali is sooo 2017. There’s another island getaway calling your name this year. Picture this: towering volcanoes, untouched wilderness, crystal-clear waters and an abundance of vineyards thrown in for good measure. Sounds like a slice of paradise, amiright? What if we told you that this magical island paradise is just a hop, step and a jump from home turf? Hint: it’s closer than Bali. We’re talking about the incredible city that is Auckland. 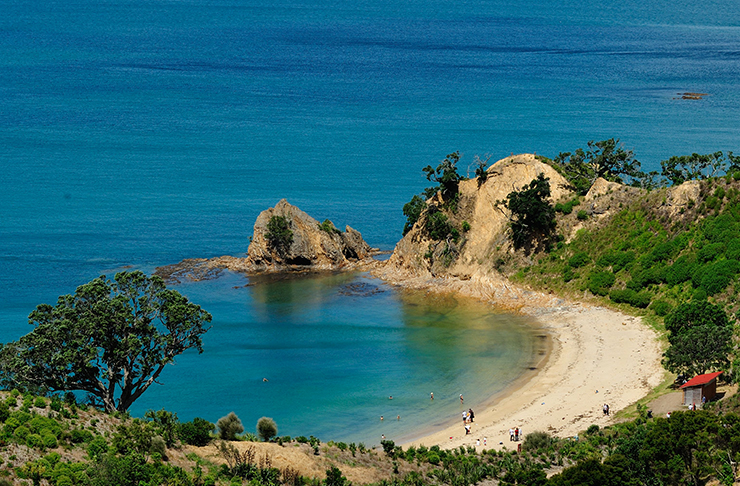 Home of the Hauraki Gulf, New Zealand’s largest city is scattered with countless emerald islands. Dreaming of an island getaway (the summer hols are quickly becoming a distant memory), we asked Auckland Tourism to give us the low-down on five of Auckland’s most spectacular islands. Looking pretty in the Hauraki Gulf, Rangitoto Island is one of Auckland’s 48 volcanoes. Just a 25-minute ferry ride from the CBD, visiting the island is an Auckland must-do. Here you’ll find walking tracks, lava tunnels and some of the best views in Auckland. The shortest and most popular route to the summit takes an hour—but don’t forget to get side-tracked by breathtaking lava caves! At the summit, feast your eyes on stunning 360-degree views of the harbour and beyond. Want even more adventure? Paddle to Rangitoto Island on a sunset kayaking tour. You’ll paddle over while the sun sets, before embarking on a trek to the summit. Refuelled by a Kiwi-style barbecue, you’ll then kayak back to the mainland with the city lights sparkling in the distance—magical! 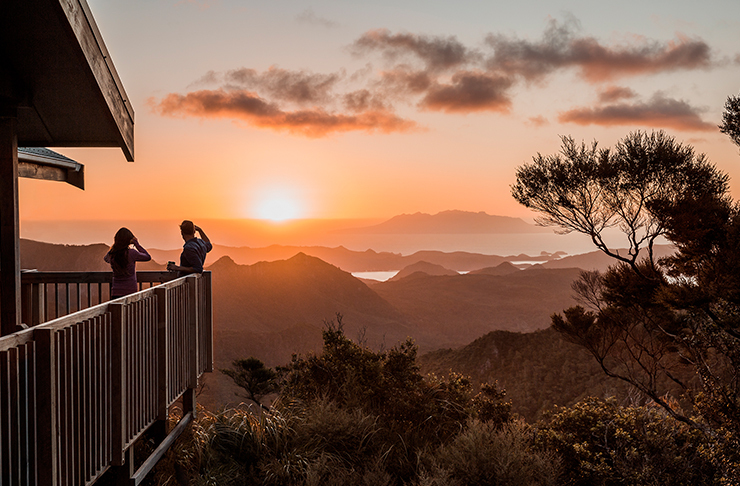 If you reeeally want to get off the beaten track, Great Barrier Island has your heart. Brimming with rugged, untouched wilderness, you’ll want to pack your hiking shoes for this adventure-filled island. Hike through native forest, explore the underwater world with snorkelling and diving, or—our fave—take a dip in the natural hot pools at Kaitoke Hot Springs. When day turns to night, the sky twinkles with thousands of stars. The island was recently declared an International Dark Sky Sanctuary—joining only two other locations in the world. Our advice? Bring your camera. This island sure knows the way your heart: wine, beautiful beaches, wine, world-class restaurants, wine, art and oh… did we mention the wine? A 40-minute ferry ride from downtown Auckland, Waiheke Island is dotted with 30 wineries and vineyards. Each one is unique in its own right, giving you the perfect excuse to drink your way around the island on a wine tour. The island is also jam-packed with nature including golden sand beaches, sea kayaking and ziplining (across the vineyards, obvs). Stay for a night or two to experience drink all Waiheke has to offer. Rich in both history and nature, Rotoroa Island is another Auckland gem. Once a sanctuary for people recovering from drug addiction (woah), the island is now accessible for all to enjoy. Creating the perfect day trip, the island offers walking tracks, native birdlife and a hella interesting museum. Swim in crystal-clear waters at one of the island’s four sandy beaches. The long coastlines and remote location mean there’s a high chance you’ll get the beach all to yourself. Take that, Bondi! Calling all nature lovers, Tiritiri Matangi is the island is for you. Covered with native forest, the island doubles as an open wildlife sanctuary. It’s home to New Zealand’s most endangered birds including the tiny North Island robin, the elusive kiwi and vivid blue takahē (a flightless bird once thought to be extinct). Explore the island by foot, stopping for a well-deserved picnic and refreshing swim at Hobbs Beach. If a day trip isn’t enough for your nature-lovin’ heart, stay overnight at the bunkhouse and wake up to the most beautiful birdsong. Itching for an island getaway? Put Auckland at the top of your travel hit-list and book the ultimate short break!